Faucet Included - Bathroom Vanities The nitty gritty features of your bathroom vanity are the little things that add personality to your bathroom. Vanity features such as Faucet Included not only shows character, but it also provides extra functionality and value. Many people focus on the layout of their bathroom for their remodels and that is important. Vanity features are those little things that are always overlooked. At first you might not think that you need but once you’ve experienced it, you may wonder why you overlooked it and it could make your life a whole lot easier. There are many unique vanity features that you can customize including counter tops, backsplashes, and open shelves. With vanity trends quickly growing and changing, bathroom vanity designers have found innovative and creative ways to improve your bathroom experience including improving comfort height and vessel sinks. 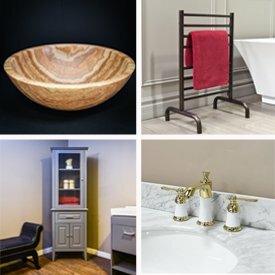 At Luxury Living Direct, we have affordable bathroom vanities filled with unique features for all budgets from top brands. Find different fixtures and cabinets built from high quality woods and finishes. Check out the sales and clearance for the current savings and promotions, all with free shipping. Need to order 2 or more vanities? Not a problem. Call our customer service representatives at (800) 574-3022 to get a special multiple vanity discount!